The 2018 construction season went by fast and will be winding down soon. We have not progressed as far as we anticipated and the project will stretch into the 2019 construction season. Listed below are a few areas of interest along the project that many people have asked about. We are continuing to place embankment material across from the Turnpike Entrance with material excavated on the project. This operation has been one of the biggest delays to the project to date because of a 72” culvert pipe that had to be relocated from the original designed location. A new alignment for the pipe was designed and when we started to excavate in the new location we found potentially contaminated material within the excavation. It is currently stockpiled and covered and awaiting permit approval to haul to a landfill. The proposed 72” pipe was needed to replace existing drainage that partially collapsed under Route 31. The project has also been challenged with poor soil conditions and excessive soil moistures that have made it difficult to construct stable embankments. 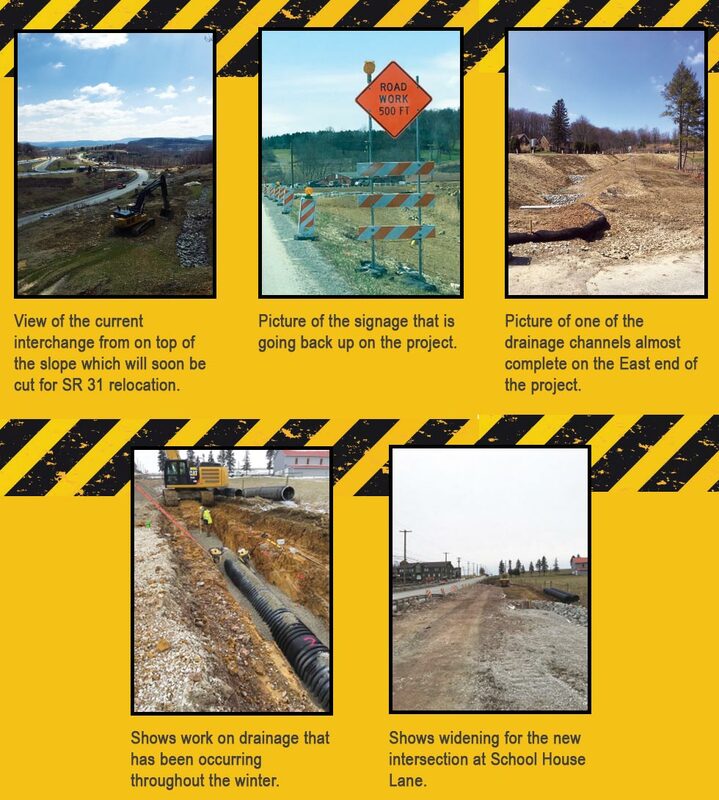 For this reason, a borrow site near SR 711 was approved to obtain rock and more stable material needed to construct the large fill across from the PA Turnpike entrance. The new asphalt we have paved across Walnut Hill is partially permanent paving and partially temporary paving. The temporary paving was placed to maintain 2 lanes of traffic in either direction while we finish the newly constructed roadway across Walnut Hill. The new School House Lane and Mountain View Road intersection is nearly complete and will be functioning as intended at the end of this season. The large excavation along the new School House Lane is a Storm water Management Pond and will ultimately be infiltrating Storm water back into the ground. The new paving at the Route 31 and Routes 711/381 intersection at Jones Mills is nearly complete for this season. There will be a few modifications that will need to be made to better facilitate a right turn lane for those making the turn onto Route 711/381. Later this month, hopefully before winter sets in, the project will be returned to normal width lanes and shoulders, to better accommodate safe travel and winter maintenance during inclement weather. The project team will continue to work through the challenges on the project so that ultimately this project will benefit this corridor to the Laurel Highlands. This project is for realignment of Route 31 at the Donegal Turnpike Interchange with the addition of a signalized continuous “T” intersection and installation of traffic signals and turning lanes at the Route 31/Route 711 intersection. Relocation of School House Road at Mountain View Road and Kings Way at Route 711 to create plus intersections will occur with the addition of signals and turning lanes. Other widening for center turning lanes and increasing sight distance will occur on Route 31, as well as waterline relocation, drainage and signing upgrades, and milling and paving from approximately 450 feet west of Hellen School Road to 525 feet east of the Route 31/Route 2031, Route 711/Route 381 intersection. Plum Contracting, Inc. is the prime contractor on this $19.8 million project. The project is anticipated to be completed by December 3, 2018. Update: Paving for current phase should finish up in the next few weeks and traffic will be switched onto the new pavement. Drainage work will continue at the SR 31 & SR 381 Intersection. A 2-day closure of School House Lane is expected 8/23/18 and 8/24/18 to construct a tie-in to the new road. Various single lane closures will be ongoing for guiderail installations, painting lane shifts, and other miscellaneous work. Crews continued to work through the winter on miscellaneous work including Sedimentation Basins, preparing for excavation at the west end of the project and finishing up the drainage installation between PNC Bank and the Holiday Inn. April 16th marked the date on PennDOT message boards as the day Plum Contracting would be resetting concrete barriers in multiple locations where lanes will be shifted and uncovered construction signs restricting the speed limit to 35MPH. Shifting traffic at the West end of the project to replace pavement and install temporary widening on the Westbound side. Shifting traffic and installing temporary concrete barriers at Diary Queen for roadway reconstruction and temporary pavement on the Dairy Queen side. Shifting traffic to complete temporary widening at the East end of the project on the Eastbound side going down the hill to the intersection at Highlands Hall. Removing and repainting traffic lines where necessary for traffic shifts. 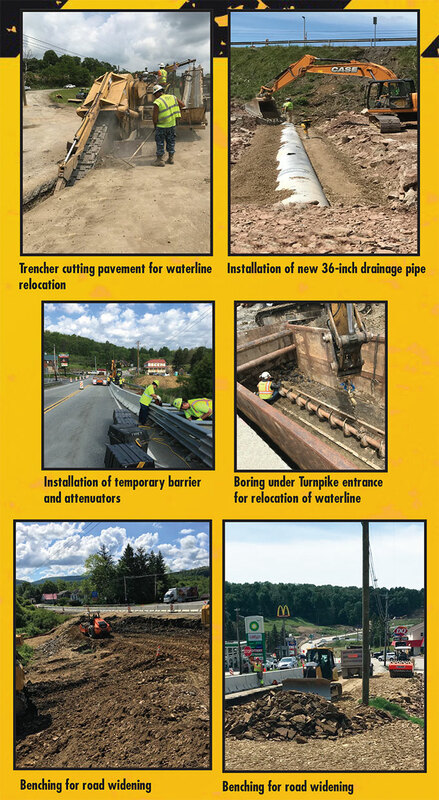 The work for the next few months at the Turnpike will occur off the roadway for installation of a new 72″ pipe, and construction of the embankment that will eventually carry relocated SR 31. The work mentioned above should be completed in under 2 months, but that is temporary widening to accommodate traffic. Once in place, additional traffic shifts will occur for relocation of SR 31 and construction of the new intersection of the Turnpike Interchange and widening and pavement reconstruction from the Interchange to PNC Bank, including the new signal at SR 711/Kings Way. Roadway reconstruction occurs from Holiday Inn to the new signal at Mountain View Road/School House Lane, and at the East end of the project for the Intersection with SR 711/SR 381. Areas in between will be milled and paved with pavement/shoulder repairs where necessary. Winter is just around the corner, but work is continuing in Donegal on State Route 31. Plum Contracting has completed temporary widening work, removed temporary concrete barriers, installed guiderail, and returned the lanes back to the original configuration. Construction signs and barricades have also been removed as planned in order to allow for winter maintenance activities. But, don’t be fooled with less orange barricades, work will continue throughout the winter as long as weather conditions permit. Motorists will notice crews continuing to install new drainage systems, which will result in daytime single lane closures as needed. Service lines for the new waterline will be connected and coordinated with local property owners. Work will also continue off the roadway to excavate and place embankment for the new roadway alignment near the Turnpike interchange. Please drive slowly through the area, use caution, and watch for workers and stopped vehicles. This project is for realignment of SR 31 at the Donegal Turnpike Interchange with the addition of a signalized continuous “T” intersection and installation of traffic signals and turning lanes at the SR 31/SR 711 intersection. Relocation of School House Road at Mountain View Road and Kings Way at SR 711 to create plus intersections will occur with the addition of signals and turning lanes. Other widening for center turning lanes and increasing sight distance will occur on SR 31, as well as waterline relocation, drainage and signing upgrades, and milling and paving from approximately 450 feet west of Hellen School Road to 525 feet east of the SR 31/SR 2031/SR 711/SR 381 intersection. Plum Contracting, Inc. is the prime contractor on this $19.8 million project. The project is anticipated to be completed by December 3, 2018. Update: Single lane closures will continue for water line relocation, drainage and miscellaneous work. Motorists should be alert and reduce speed through the work zone. This is a resurfacing project for Route 381 from Falling Water to Route 711 in Springfield and Steward Townships. The contractor on this $2.6 million project is Golden Eagle Construction Co. It will tentatively complete in early 2018. Update: In the next few weeks the contractor will be placing leveling and then the final wearing course. In additional to that, driveway tie-ins, new guiderail and new line painting will follow. Please be alert for single lane traffic patterns. This is a highway reconstruction project on Route 119 between the Westmoreland/Fayette County Line to just past the Westec Drive Exit in East Huntingdon Twp. This project will allow crews to begin to reconstruct the northbound and southbound lanes of Route 119 and replace the existing grass median with a concrete barrier and pave the inside shoulders from the southern limits of work to the Route 119/Route 31 Interchange. The southern entrance and exit ramps at the Route 119/Route 31will be lengthen along with the reconstruction of the roadway surface of all ramps. The Route 119 roadway profile will be lowered approaching and under the Route 31 and Route 981 bridges that span over Route 119. The project will also include upgrades to drainage, guiderail, signing, and pavement markings. Bridge preservation work will also occur on the Route 31 and Route 981 bridges that span Route 119. The contractor on this $37.8 million project is Golden Triangle located in Imperial, Pa. The project completion date is November 1, 2017. Update: Cement treated permeable base course on mainline will be completed in a couple of days. SR 31 and 981 bridge repairs with be starting soon. Ramp M is closed for approximately 43 days. Work in the median at the southern end of the project is ongoing. Currently traffic is restricted to one lane northbound and one lane southbound operating in the southbound travel lanes during this Phase 2 and Phase 3 work. Crews are gearing up to replace six of Fayette County’s structurally deficient bridges in 2017. Outlined below are details of those replacement projects. The project consists of the replacement of the existing structurally deficient bridge built in 1937 carrying SR 1001 over Mill Run. Approximately 184 vehicles travel across the bridge daily. The proposed curb to curb bridge width will increase from the existing 15 feet to 22 feet to accommodate two lanes of traffic. Minor approach roadway work and drainage work will take place to tie the new structure into the existing approach roadway. Construction is anticipated to begin in mid-June 2017 and be complete in mid-August 2017 with traffic being detoured during construction. The project consists of the replacement of the existing structurally deficient bridge built in 1937 carrying SR 1003 over Laurel Run. Approximately 237 vehicles travel across the bridge daily. The proposed curb to curb bridge width will increase from the existing 14 feet to 22 feet to accommodate two lanes of traffic. Minor approach roadway work and drainage work will take place to tie the new structure into the existing approach roadway. Construction is anticipated to begin in mid-June 2017 and be complete in mid-August 2017 with traffic being detoured during construction. The project consists of the replacement of the existing structurally deficient bridge built in 1956 carrying SR 1007 over Champion Creek. Approximately 918 vehicles travel across the bridge daily. Minor approach roadway work and drainage work will take place to tie the new structure into the existing approach roadway. Construction is anticipated to begin in mid-July 2017 and be complete in late September 2017 with traffic being detoured during construction. The project consists of the replacement of the existing structurally deficient bridge built in 1941 carrying SR 1050 over Champion Creek. Approximately 1,059 vehicles travel across the bridge daily. Minor approach roadway work and drainage work will take place to tie the new structure into the existing approach roadway. Construction is anticipated to begin in mid-May 2017 and be complete in mid-June 2017 with traffic being detoured during construction. The project consists of the replacement of the existing structurally deficient bridge built in 1938 carrying SR 1058 over Indian Creek. Approximately 1,738 vehicles travel across the bridge daily. The proposed curb to curb bridge width will increase from the existing 23 feet to 34 feet to address current design standards. Minor approach roadway work and drainage work will take place to tie the new structure into the existing approach roadway. Construction is anticipated to begin in mid-June 2017 and be complete in late October 2017. During this time, one lane of traffic will be maintained with temporary traffic signals. The project consists of the replacement of the existing structurally deficient bridge built in 1936 carrying SR 1058 over Roaring Run. Approximately 1,738 vehicles travel across the bridge daily. The proposed curb to curb bridge width will increase from the existing 24 feet to 32 feet to address current design standards. Minor approach roadway work and drainage work will take place to tie the new structure into the existing approach roadway. Construction is anticipated to begin mid-June 2018 and complete late October 2018. During this time, one lane of traffic will be maintained with temporary traffic signals. Approximately two weeks prior to the start of construction for each bridge, a press release will be issued, along with signage near the bridge approaches to warn motorists of the planned construction. All bridges under this program are assigned a JV number. JV references the joint-venture partnership between Walsh/Granite, which is leading construction for the entire project. You can find bridges and their JV numbers on the project website here: http://parapidbridges.com/bridgesbycounty.html. For information on these bridge projects, visit www.parapidbridges.com. You can also call or email the project hotline at 877-444-9990 or info@parapidbridges.com. The project is progressing well and we are on schedule for our March 2017 let with construction NTP beginning in May 2017. We are hoping to complete in two construction seasons and finish late in 2018. Entire project – early activities are: demolish structures, clear and grub, and install erosion and sedimentation control features. Turnpike area – install 72” culvert, build large embankment and excavate large cut on south side of SR 0031, install drainage along SR 0031. SR 711/SR 31 intersection to School House Lane – install drainage and storm water basin, close Mountain View Road to install drainage and pave roadway, excavate cut on north side of SR 0031 where alignment is being shifted. School House Lane to just west of SR 381/SR 711 intersection – install drainage. SR 381/SR 711 intersection to eastern limit of project – Close SR 2031, construction storm water basin and drainage. Note: If this work is started in 2017, SR 2031 will be opened back up to traffic over the winter until the spring of 2018, when it will be closed again to complete intersection work. The majority of the waterline relocation work to will occur during 2017. Single closures on SR 31 will occur at various locations throughout 2017. Note: The successful contractor has the option to change the sequence of operations, provided PennDOT concurs. Your Mountain Laurel Chamber Board of Directors have been considering what first and lasting impressions people will have when entering or leaving the Laurel Highlands ONCE the Route 31 road work is completed. In his TED TALK (go to www.scenic.org to listen) former Scenic America President, Ed McMahon provides insight into “how the image of a community is fundamentally important to its economic wellbeing”. The BHHS office that I work out of in Donegal faces Route 31. Every day I see and hear the vehicles that pass by my window. I am constantly reminded that this may be a home to these travelers, a getaway, a onetime visit, a repeat visitor or someone passing by for work. What do they think of when they pass through? How do we get them to stop at our businesses? What can we do to entice them to come back, AND, hopefully tell their family and friends of the wonderful experiences that await them in the Laurel Highlands? Be a part of the change you want to see. Harrisburg, PA – Pennsylvania motorcyclists can now show their support for veterans by purchasing newly authorized “Honoring Our Veterans” special fund registration plates for motorcycles. The plate, authorized by Act 17 of 2015, features the standard registration plate design in blue, white and yellow with an image of the American Flag and a Bald Eagle with the words “Honoring Our Veterans” at the bottom of the plate. The plate is available at a cost of $35. Fifteen dollars from the sale of each license plate goes to the Veterans’ Trust Fund administered by the Department of Military and Veterans Affairs. The fund supports and assists Pennsylvania veterans and their families through grants to veterans service organizations and other charitable organizations. Motorcycle owners can apply for a plate by completing and submitting Form MV-914, “Application for Honoring Our Veterans Special Fund Registration Plate,” found on the PennDOT website at www.dmv.pa.gov by choosing “Registration Plates” in the “Vehicle Services” section, and then clicking on the “Special Fund” tab. The project is located in Donegal Township, Westmoreland County and includes safety and capacity improvements along the SR 0031 corridor. The SR 0031 Section X10 project includes; realignment of SR 0031 to the south at the intersection of the PA turnpike interchange to provide auxiliary turn lanes for PA turnpike bound traffic as well as more capacity for the exiting PA turnpike traffic merging onto SR 0031, two new traffic signals; one at the intersection of SR 0031 and the PA turnpike interchange and the other at the intersection of SR 0031 and SR 0711, and improving the existing horizontal geometry adjacent to the SR 0031 and SR 0381/0711 intersection to increase sight distance as well as a right-turn lane for SR 0031 eastbound traffic turning onto SR 0381/0711. Additionally, the project scope includes relocating King’s Way to form a “plus” intersection with SR 0031 and SR 0711, and the relocation of School House Lane to form a “plus” intersection with SR 0031 and Mountain View Road. This project is presently scheduled to let in the summer of 2016. The Pennsylvania Department of Transportation, Engineering District 12-0, invites you to attend a public display of plans for the reconstruction of SR 0031, Section X10, Donegal Interchange to the SR 0031/SR 0381 Intersection. The project is located in Donegal Township, Westmoreland County and includes safety and capacity improvements along the SR 0031 corridor. The SR 0031 Section X10 project includes; realignment of SR 0031 to the south at the intersection of the PA turnpike interchange to provide auxiliary turn lanes for PA turnpike bound traffic as well as more capacity for the exiting PA turnpike traffic merging onto SR 0031, two new traffic signals; one at the intersection of SR 0031 and the PA turnpike interchange and the other at the intersection of SR 0031 and SR 0711, and improving the existing horizontal geometry adjacent to the SR 0031 and SR 0381/0711 intersection to increase sight distance as well as a right-turn lane for SR 0031 eastbound traffic turning onto SR 0381/0711. Additionally, the project scope includes relocating King’s Way to form a “plus” intersection with SR 0031 and SR 0711, and the relocation of School House Lane to form a “plus” intersection with SR 0031 and Mountain View Road. The purpose of the meeting is to present the preliminary roadway plans and to obtain public input prior to completing the design process. In keeping with Federal, State, and local policies concerning public participation in planning and developing transportation projects, the public is encouraged to attend this public meeting. In compliance with the Americans with Disabilities Act of 1990 (ADA), the meeting has been scheduled at a facility that is accessible to individuals who have disabilities. Any person having special needs or requiring special aids is requested to contact Ms. Nancy Kolenc, Project Manager at (724) 439-7377 prior to the meeting so that special accommodations can be made. Anyone with knowledge of historic resources in the project area or with comments on potential impacts to historic resources should attend this meeting. The meeting will be conducted in an open house format. PennDOT and their representatives will be available for discussion and to answer questions. Everyone who is interested in the project is invited to attend anytime during the meeting hours. projects included in the department’s Four and Twelve Year Plans. In addition to demonstrating the breadth of improvements being made across the state, the Transportation Projects site allows users to view projects according to categories such as county, statewide, PennDOT district and more. The construction section also allows users view projects on Pennsylvania Interstate corridors. The website and mapping tools are also compatible with mobile devices. For the latest information on current travel conditions, motorists can check information on more than 40,000 roadway miles by visiting www.511PA.com before they leave home. 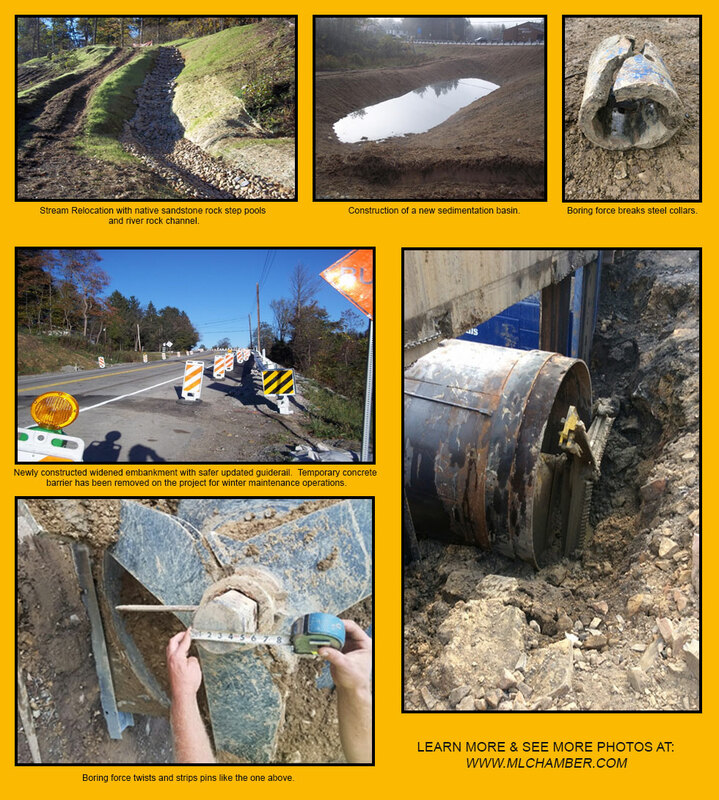 511PA, which is free and available 24 hours a day, provides information on current traffic impacts from construction, traffic delay warnings, weather forecasts, traffic speed information and access to more than 770 traffic cameras. PennDOT and Consultants Gibson-Thomas Engineering Company extends and invitation to attend a Public Meeting & Plans Display to anyone who is interested in the Route 31 Corridor Project extending from the Pennsylvania Turnpike Interchange 91 to the 31/381 Intersection at Sarnelli’s Corner. The meeting is Tuesday, March 24th, from 5-7 pm at the Days Inn in Donegal. As a chamber of commerce, our duty is to represent the interests of our area’s businesses including the community in which they operate. When it comes to our highways infrastructure it is our duty to build awareness and educate. Kevin Bittner, P.E. Highways Division Manger, of Gibson-Thomas Engineering Co., Inc. concluded a series of thee public display meetings for the reconstruction of SR 0031, Section X10 Donegal Interchange to SR 0381 Interchange Sarnelli’s Corner. The purpose of the meetings were to present the preliminary roadways and to obtain public input prior to completing the design project. Safety and capacity are equal issues for improving the existing corridor. Representation from nearly 30 businesses attend the June 17th, 2014, 1:00 p.m. chamber member meeting where they had the opportunity the hear presentation directly from the engineers along with having an opportunity for input. Special thanks to PennDOT District Plans Engineer Liberty Hill, PennDOT Project Manager Brian Svesnick and Kevin Bittner Gibson-Thomas Engineering and to everyone at PennDOT & Gibson-Thomas for spending the day with MLCC members, presenting preliminary plans, answering questions and for taking back valuable input . Attention members: Please look for additional meeting notices pertaining to all interests of the organization as we strive to build awareness directly from the source.